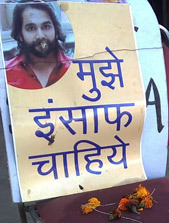 It has been one month since a young photographer Ankit Saxena was murdered for being in love with a Muslim girl in west Delhi’s Raghubir Nagar. Much has already been said in the media about the brutal murder while the detained perpetrators have admitted to their crime. But before his death is forgotten under the burden of other trendy news, some of us from the forum Indian Muslims for Secular Democracy decided to visit Ankit’s family and express our concern, even though a bit late. With me were Zulaikha Jabeen, Dr. Rahul and Pankaj. As we were moving towards Ankit’s house in Raghubir Nagar in an e-rickshaw we noticed an ongoing fight on the busy road – a few truck drivers were apparently beating up another man near some parked trucks. Shocked to see this, we asked the e-rickshaw driver to stop in case we could stop the beating. But instead of stopping, he increased his speed, saying, “if you intervene, you will get beaten up”. He continued driving despite our requests to stop. This is the typical crowd mentality in India, which even Ankit’s parents saw with onlookers on February 1, as they tried to save their son from being attacked by the girl’s family. 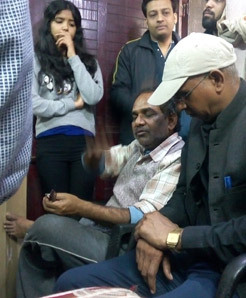 This is one of the regrets that Ankit’s father Yashpal has: “No one from the crowd came forward to helpmy son”. Ankit’s murder was chilling – his mother saw the son’s throat being slit by a sharp knife – a fact that would shock anyone. While they were rushing him to the hospital, the mother tried to stop the bleeding by putting her hand on the throat, but noticed her fingers going right into the slit throat. “It was all over in three seconds”, said the father, “My life was turned over in three seconds”. Ankit was their only child and a bread-earner since the father is in his sixties and a heart patient. Ankit had just begun rising in his career as a wedding photographer, and no less than a handsome model himself as his portraits at home reveal. Some of his photos show him in backdrops of different religious spaces such as a gurudwara or a mosque. In these times when countless couples deciding to marry outside their religion or caste in India are being attacked either by mobs or their own relatives, this murder was bound to bring a communal backlash since a Muslim family was involved in killing a Hindu boy. Raghubir Nagar and surrounding areas were surely tense for a few days after the murder. But Ankit’s father, despite his personal tragedy, saved a larger tragedy from happening by appealing to the people through media not to see the perpetrators as Muslim. Not only that. He now wants to keep his son’s memory and legacy alive by creating an institution or group that will carry on the message of love and harmony. However, the parents do not have the means to even carry out their daily lives, which involve treatment of their illnesses – Ankit’s mother has high blood pressure and diabetes. It is unfortunate that despite Delhi’s chief minister Arvind Kejriwal meeting them thrice, the government has not provided any sort of monetary help or compensation for the loss of their child. It had promised them free medical help in a government hospital, but after consulting a doctor there, the couple had to pay for medicines worth Rs. 2,000 from their own pocket. They are mostly being taken care of by their nephew Ashish Duggal and few other relatives – Ashish doing much of the legal formalities at the moment.